A lot of musicians would definitely agree that the acoustic guitar is a user-friendly type of musical instrument that you can learn. At the same time, it is also one of the most popular. Studying how to play the acoustic guitar enables you to play different types of musical genres – rock, acoustic, blues, pop, and jazz. Indeed, it is the best guitar that you can begin with. Keep in mind, at this point, that aside from the acoustic guitar, there are also other types of guitars that you can also learn playing, such as the classical and electric guitars. However, what makes the acoustic guitar a very special option is that you can play all genres using this type of guitar. For these reasons, an acoustic guitar easily becomes a popular choice for people who want to learn how to play a guitar in general. If you are interested in learning how to play the guitar because your goal is to become a rockstar, you may have to learn how to play an electric guitar. However, if you are a beginner, this might be a tricky thing to do. The best option is start with an acoustic guitar. This will allow you to learn those fine details and basics in guitar playing. As a matter of fact, the best rock stars these days began with learning how to play an acoustic guitar in order to master their skills. Step 1: Study your guitar well. This is the very first thing that you need to do, familiarizing yourself with your own guitar so that you will also know how to produce great music out of it. Step 2: Learn tuning. For this, you have the option to buy a guitar tuner. However, it can also turn out to be an advantage if you learn tuning your guitar manually. This is quite useful if you are interested in traveling or in certain scenarios where having access to a tuner is difficult. Step 3: Start with the simple ones. Learning how to play your acoustic guitar as well as other instrument may turn out to be frustrating, which is why a lot of people stop because they feel disappointed and frustrated. Step 4: Learn how to read guitar tabs or ‘tablatures’. It is expected that you know how to read guitar chords because this is the only way that you can enjoy playing different music with your guitar. This may look foreign at your first glance. However, once you have started to learn reading musical notations, eventually you can discover how fast it is for you to learn playing. Step 5: Get a teacher. Since we are talking about learning how to play the acoustic guitar fast, doing so by yourself may be a difficult path to take. It would be better to have someone who is already expert in this field to teach you the basics. If you want to continue learning by yourself later on, you can do so, but you need to have a good grasp of the basics first and foremost. It is also your option to learn playing guitar with the help of a teacher all the way until you master everything. Of course, this does not mean that you have to spend a good amount of money for professional help, as you can always find a close friend who can teach you the tricks for free. Step 6: Learn your chords and notes. 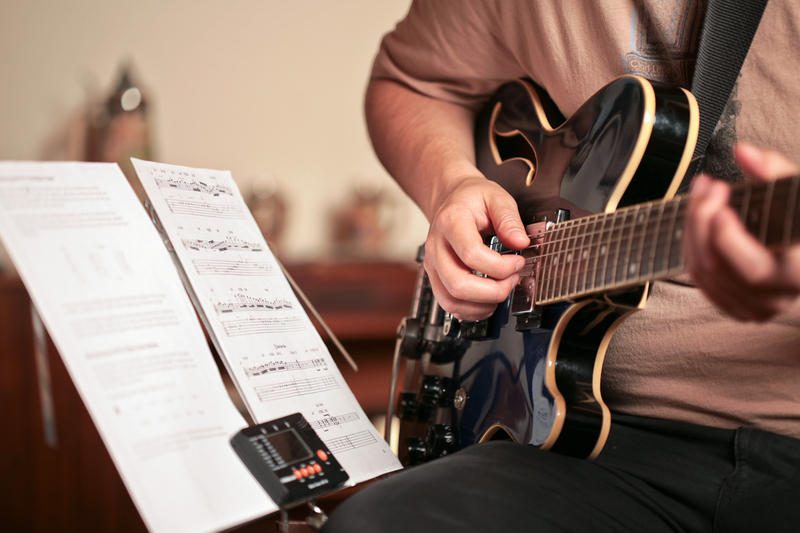 Aside from familiarizing your guitar tabs, it is also important to focus on learning the chords and notes. This should serve as a solid foundation for playing music. Start simple and learn how to play the simplest ones first. In this way, you can easily avoid getting frustrated or disappointed if you fail to get chords that are considered difficult and challenging. Step 7: Deal with pain. If you are still new to playing guitar, you will often find yourself feeling the pain in your fingers. However, just do not allow pain to stop you from pursuing your goal of playing the acoustic guitar. After all, at this point, you may have already known that you also need to feel pain in order to learn. By learning how to play the acoustic guitar, you have to expect having sore fingers. Step 8: Practice, practice, practice. Keep in mind all the time that people you look up to in terms of playing guitars often start like you. However, because they just kept on practicing, they were able to achieve their goals. If you want to find yourself getting started on the right track and master playing the acoustic guitar, there are some things that you definitely have to remember. While you have a goal set in mind, do not forget to have fun. Make sure that you are viewing this opportunity as interesting. People who cannot find the joy in what they are doing often end up getting frustrated in the end. This can be done by focusing on playing songs that you really like, as well as chords that you have perfected well right before, and right after your practice jams. Patience will always be a virtue. Therefore, if you are not patient before, learn this valuable trait now. You definitely need this when it comes to learning how to play the acoustic guitar. Everyday we continue to learn. Do not stop with things that you think you already know. Learn from other people. With the power of the internet, you can watch tutorial videos and eventually find yourself perfecting your skill. Jam with friends as this will allow you to create a circle with those who also love the same passion. This will definitely allow you to learn more.